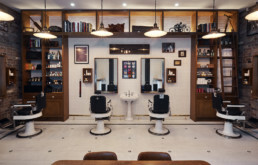 The Barber Shop has locations at York Street, Sydney and Barangaroo, Sydney. Immerse yourself in the nostalgic atmosphere of one of Australia’s finest barbering experiences. No matter which service you book, our team of highly experienced barbers will ensure you leave looking and feeling a million dollars! The Beard Styling experience includes a Beard Trim and Style while sipping on an exclusive Balvenie Whisky Cocktail. *Our vouchers have a 12 month expiry date from the date of purchase (our vouchers are “Excluded vouchers” under the new legislation of the Fair Trading act 1987 which came into effect on 31st march 2018). **Items will post the next business day after the day of purchase.Unfortunately we do not have control of Australia Post.Please allow up to 5 working days for regular postage and allow up to 2 working days for Express post. Alternatively, you may purchase in store at either of our York Street or Barangaroo Barber Shops.